Nobel Laureate, Professor Wole Soyinka, has said that he had accepted President Muhammadu Buhari’s apology to the Abiola family on behalf of all Nigerians. He stated this on Tuesday during the Special National Honours Investiture in Abuja, the nation’s capital. “Most of what I wanted to say has actually been yanked off my throat by one singular gesture – the presidential apology,” he said. Soyinka also called on the Federal Government to create a Hall of Shame just as it celebrates distinguished Nigerians in the Hall of Fame. He added, “Today perhaps is also a day to inaugurate our Hall of Shame so that as we have our Hall of Heroes in one hand, we also have our Hall of Shame as a lesson to future generations,” he said. His comments come at a time the nation marks the 25th anniversary of the presumed winner of the 1993 Presidential election, Chief MKO Abiola. According to the Nobel Laureate, the conferment of the Grand Commander of the Federal Republic (GCFR) by President Muhammadu Buhari on Chief Abiola does not mark the end of the June 12 struggle. However, his comment has been sparked with a mixed reaction as some are of the opinion that he had referred to the late Head of State, Sani Abacha, while others believe the professor referred to General Ibrahim Babangida, the former Head of State that annulled Abiola’s election. 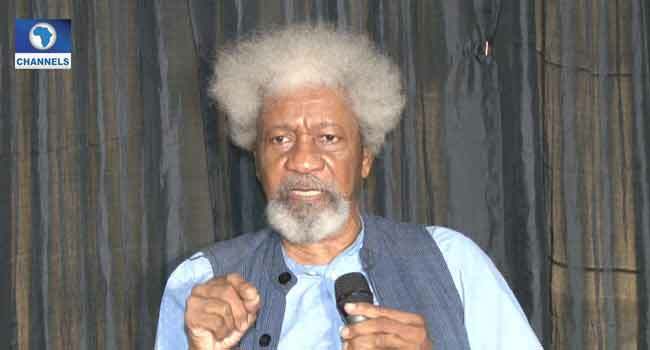 Soyinka also criticized the Federal Government in its corruption fight after alleging that a major road in the Federal Capital Territory is named after a former Nigerian leader he described as being corrupt.